We’ve scoured the web to round up a list of the best wedding makeup artists in Bristol for brides seeking a glam look, something more natural – and everything in between! In no particular order, here are 8 MUAs we think you should know about if you’re planning a wedding in Bristol. Sally Bracey is an award-winning bridal makeup artist who works with brides in and around Bristol and Somerset. Using MAC, NARS and other leading brands, you’re in safe hands when you’re with Sally – she doesn’t care if you change your mind 10 times during your trial, all she wants is for you to be totally honest with her and come away with a look you’re 100% happy with! For the ultimate glam bridal makeup, look no further than airbrush makeup artist Georgie and her team at Bristol makeup salon Dollz Boutique Studio. With eight makeup artists, two hair stylists, two heated roller specialists and one spray tanner, your bridal party has everything it could ever ask for! Elle Hitchens is a M.A.C trained makeup artist based in Bristol, is fully mobile and uses high-end brands for wedding makeup like Chanel, NARS, Charlotte Tilbury and more. She’s working towards a 100% vegan and cruelty-free makeup kit, so you won’t have to compromise on your ethics for your big day. She’s also an advocate for organic skincare, and even offers a mini organic facial alongside your makeup on the day. Check out her real bride Loni below who got married at one of our favourite wedding venues to work with, Aldwick Estate! 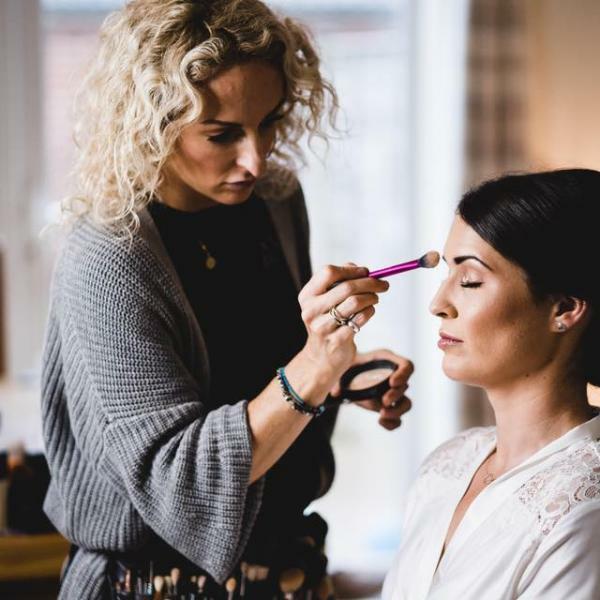 Adorning brides with youthful and fresh-faced looks on their wedding day, Annabella is a MAC Cosmetics expert based in Clifton, Bristol and has an Instagram feed to die for. Bristol-based Evie likes to describe herself as potentially “the geekiest makeup artist on the planet”. A multi-lingual musician on the side with a fascination for the universe, her vibrant personality really shines through – just take a look through her feed and feel the love in each and every story she shares about her beautiful brides! We think you’ll love her. Jessica is a multi award-winning bridal makeup artist based in Bristol. She’s in high demand with a carefully selected team of backup artists to cover her when she’s unavailable – and from looking through her portfolio of beautiful brides, you can see why! From soft and natural to full-on glam, we’re in awe of Jessica’s talent. If you’re after a natural, boho-inspired wedding makeup look, Isabel While is the MUA for you. Think romantic, relaxed, elegant, whimsical – we feel like we’ve been transported to times gone by. Dreamy. Charlotte is an award-winning makeup artist who’s been published in some of the leading bridal magazines – we had a tough time choosing just one photo of her incredible work to share with you! Charlotte is based in Wiltshire and covers the entire South West including Bristol and Somerset.